Posted on April 10, 2017 at 7:58 am. SlotsMillion online casino is making it easier for players when it comes to promotions and bonuses. The site has introduced a brand new Bonus Guard program which acts as a helping hand when it comes to bonus play – many players can get blindsided by the terms and conditions. New players and gamblers who aren’t familiar with online gaming often overlook the stipulations, such as wagering requirements and participating games which players must adhere to in order to claim the bonuses. The program includes a MaxBet feature, which has been applied to the 1000-plus slots available at the online casino. It instantly notifies players once they have wagered more than they need to in order to complete the bonus terms. This means players won’t ever unintentionally bet more than they need to meet wagering requirements. Take the $100 new players bonus as an example. Players can claim it when they first sign up but to clear it as real cash they need to play it through 35x. With this feature, players will be notified once the turnover requirement has been met. SlotsMillion has also included a Restricted Games feature to the program. This prevents players from voiding the bonus terms due to playing a non-applicable game – these include all table games which we detail below. Each slot available, including titles from the top providers such as Microgaming, Net Entertainment, BetSoft, Quickspin and more, have pop-up notices which explain whether the games can be played to clear bonuses. This new addition from SlotsMillion coincides with developers, which are making it more entertaining for players – changing the way gambling is delivered. Popular slots provider, Quickspin, recently announced its plan to add a new model to its slots, known as the Achievement Engine which increases the level of interaction. Players unlock levels to trigger bonus rounds creating a new element to online gambling. 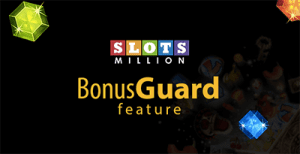 The Bonus Guard program isn’t the only addition to SlotsMillion – the once slots-exclusive site has added a huge range of table games. There’s a variety of blackjack, roulette, and poker variants available as well as keno, video poker and scratch cards. These games are powered by a range of software developers including Microgaming, NetEnt, Play’n Go, iSoftBet, 1x2Gaming, NextGen, and MGA. Players can locate their preferred game and provider using the same handy search filter which makes locating slots easy at the online site. Promotions don’t apply to the table games for the time being, but we will keep you updated if this changes. Slots tournaments have also been added which can be accessed via the top menu panel. Players can go head-to-head with other gamblers from around the world on popular slots at the top online casino. Sign up at Slots Million and claim a welcome package which includes 100 free spins.